Wachendorff Automation has extended its absolute encoder series WDGA with the addition of an EtherCAT interface. The WDGA58F is a miniature encoder with bus cover for the EtherCAT interface. Due to its small size, it saves valuable installation space, which can be a decisive design consideration in new or advanced machines, as the trend towards smaller machines continues. Despite its compactness, the rugged bearing design ensures long service life and maximum durability. 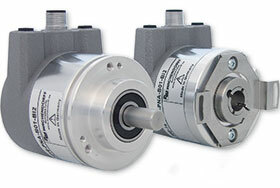 The encoders are supplied in hollow shaft and clamp/synchro-flange versions. Multi-turn encoders are equipped with maintenance-free EnDra technology, while the innovative single-turn range with QuattroMag provides a high resolution of up to 16 bits and an accuracy of 12 bits. This makes it possible to use robust and durable magnetic technology from Wachendorff in many areas where previously only high-precision and sensitive optical measuring technology could be used. The new EtherCAT absolute value encoders with SM3 mode, distributed clock and Can over EtherCAT deliver their high-precision position value with a cycle time 50 μs and are thus perfectly equipped for the latest controllers in the field. Plant and machine builders also benefit from the modular principle used for the design, which allows customer variants to be implemented quickly and efficiently.